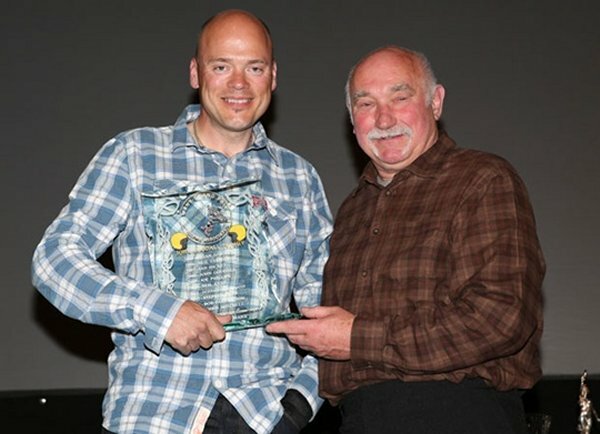 Chris Mitchell receives " Spirit of the Manx "
The award is presented annually to the rider who is considered by his fellow racers, all members of the Manx Grand Prix Rider’s Association, to best represent the spirit of sportsmanship and endeavour. Chris received more votes than any other rider in the ten year history of this award. Having lost an arm in an accident several years ago, Chris had shown unbelievable determination in overcoming his difficulties in order to get onto the grid at the Manx. During the 2013 Manx Grand Prix he lapped in excess of 100mph, gained a replica in the Newcomers Race and finished 37th in the Supertwin Race. Unfortunately mechanical problems, during practising meant that Chris was unable to qualify to race this year. the 2014 Manx Grand Prix Guest of Honour.